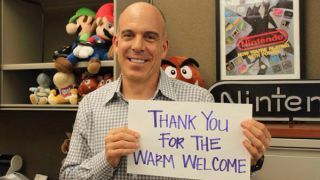 In case you hadn't already heard, Nintendo has hired a guy named Doug Bowser as its new VP of sales in the US. That's right, he shares his surname with the name of Mario's number one foe. Nepotism, eh? Still, Bowser was warmly welcomed by the internet at large (that's YOU GUYS) according to this recently tweeted picture. Sure, we make light of it now, but how long before the kidnappings start? How long before he reveals himself as a dinosaur and literally eats another human? How long before we realise we made a huge mistake?